As the name implies, these levels have compensators that automatically level the crosshairs, making them far more accurate and easy to set up that the old four screw levels. Levels from 20 to 32 power will meet the needs for both accuracy and range for virtually all construction applications. Whether your job is excavation, concrete, landscape, or interior construction, we have the correct laser for you. We have grade, slope, pipe and a variety of interior lasers to meet the need of all contractors from the beginning to end of the job. 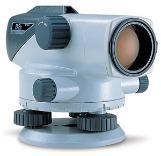 Total stations combine the angle accuracy of theodolites with equally accurate electronic distance measurement. 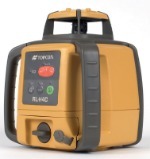 Total stations when coupled with a data collector are an extremely productive layout tool for the contractor. 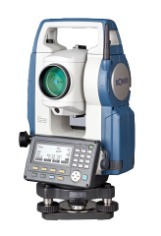 The conventional total station has been the work horse for construction layout for over 25 years. The increased use of GPS and Robotic Total Stations has dramatically reduced the demand and hence the price of these instruments, making them affordable for any contractor with layout requirements. We have a wide range of models and prices. Robotic total stations have been around for decades, but with the introduction of Trimble's S6 and SPS MagDrive series, their popularity has skyrocketed. These units are fast, rugged, self contained and easy to use with a number of data collector options. The cost savings of the one man robotic total station is dramatic and immediate. The contractor has a choice on both the platform and the software to match his budget, experience and job demands. All these units are rugged, IP67 waterproof, powerful, and user friendly. 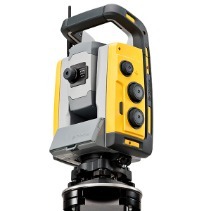 Theodolites have for the most part replaced transits on the jobsite. Their digital readout makes turning angles far more accurate and easy to read. Angle accuracy is 1/16 of an inch @ 100 ft. for a 10 second instrument. More accurate instruments are available as well as units with laser pointers.